SG Enterprises offer EVERDIGM brand of rock breakers in India, which have a proven history of working most efficiently in different applications under extremely tough working conditions in India. 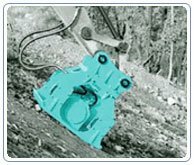 Our EVERDIGM rock breakers also come with the added advantage of working perfectly with almost all brands of excavators available in India, such as, Larsen & Tubro, Telcon, Hyundai, Komatsu, JCB, Volvo, Hitachi, Caterpillar, Kobelco and BEML etc. Choosing EVERDIGM for your operations can make you feel assured about the reliability of delivery and a promise of high profitability at optimum investment cost. Now Real estate market is going up day by day. Our machines are very useful in the sector. Our company offer our products for services like JCB, Komatsu, Hitachi, Kobelco etc. Working tirelessly from the very beginning, we at SGEE have always endeavored to source the most up-to-date technology conforming to the highest international standards at the most viable prices. We are constantly on the move, establishing ourselves with our top-of-the-line products’ offerings, reasonably priced spare-parts, well-informed service & support and a pan-India dealer network to enhance our reach to a larger base of customers with top quality construction machinery.